Civita, an urban-style community in Mission Valley designed for nearly 5,000 homes, is planning for environmentally-friendly transportation with 12 charging stations for electric vehicles. 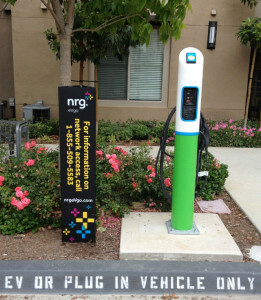 Developer Sudberry Properties said it has partnered with NRG eVgo , a subsidiary of NRG Energy, Inc., to install six electric charging stations at Westside Drive and Civita Boulevard. Six additional stations are scheduled for installation at the West Park apartment community, which is planned to open in late summer. “We selected NRG eVgo electric vehicle charging installations for the convenience of our residents and the public. Additional charging stations are planned as Civita grows,” said Marco A. Sessa, senior vice president of Sudberry Properties. Civita charging stations are also accessible by the car-sharing service car2go, which has 380 all electric vehicles in the San Diego fleet. “NRG eVgo is proud to partner with Sudberry to bring easy, reliable and affordable EV charging to Sudberry’s Civita community,” said Terry O’Day, vice president of NRG eVgo in California. Plans for the 230-acre property, located on a former quarry site, call for 4,780 homes and apartments in numerous configurations, approximately 480,000 square feet for a retail center and 420,000 square feet for an office campus. In addition to making the use of EVs convenient, Civita encourages the use of public transportation and walking. The San Diego Trolley is nearby and future plans call for the construction of a pedestrian bridge over Friars Road to make the trolley even more accessible.